A "Scottish Village" in the shape of a Saltire and has been opened at Gleneagles to promote the nation to guests at the G8 summit. The village is located at the main entrance to the complex and is divided into four zones housing tourism, business, enterprise and government. The 2,500 journalists based at Gleneagles will have to pass through it to use the G8 media centre facilities. The £1m village was opened by First Minister Jack McConnell. He said: "The Scottish Village at Gleneagles will promote the best Scotland has to offer. 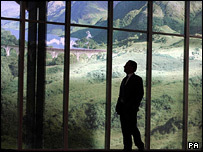 "G8 offers us a unique opportunity to show everyone why Scotland is a great place to visit, live, work and do business. "The eyes of the world will be on us over the next week and Scotland must take advantage." Scottish Development International - showcasing life sciences, energy, financial services and computer games. Whisky - an area created by drinks giant Diageo which owns a number of distilleries in Scotland. The village also includes a football section giving visitors a chance to try table football where Scotland play an international team made up of the G8 countries and the EU. Meanwhile, the Scottish Tartans Authority has commissioned hundreds of accessories for the G8 summit from weavers Lochcarron of Scotland. The firm has made 300 scarves, 500 ties, sashes and 50 stoles in a specially created G8 tartan. The authority received orders from the Foreign Office, Scottish Executive and Perth and Kinross Council. Some items are expected to be gifted to heads of states and their wives at Gleneagles. G8 cufflinks have been made by a firm in the Borders and a number of teddy bears with G8 tartan paws and scarves have also been produced. 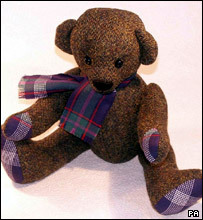 The tartan was designed by Brian Wilton, director of operations at the Scottish Tartans Authority. He said: "I would imagine the items will be used to welcome delegates and guests at the summit. "This has been really good for the business and it has highlighted the huge promotional potential of tartan. "It has also shown the versatility of tartan as an art form. People get so used to it being on things like shortbread that they sometimes forget it can have other uses."